ETI's offers a range of lighting options to efficiently provide illumination in tactical environments. The Personal Solar Lighting™ kit is a completed power system for emergency, camping, outdoor events, or other travel uses. The battery module can light two 12 V, 1 Watt led lamps. Good design, easy to use, virtually no running cost, green and environmentally friendly. 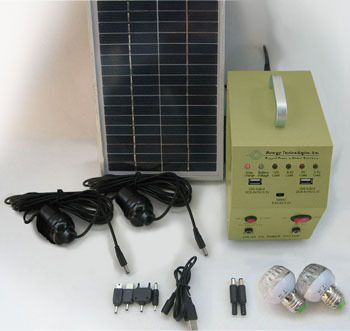 The solar kit can also charge MOBILE PHONES, MP3, MP4, MP5, CAMERA, GPS, PDA VIDEO, etc. via its USB ports. Extreme Environments: ETI Solar Lighting Trailers are designed for extreme temperature environments from unprotected desert installations to frozen tundra operating temperatures -40°C to 55°C. Reduced Energy Consumption:Environmental benefits of solar power help meet federal mandates for energy reduction. High efficiency LED lights also require less power than fluorescent lights for reduced power consumption. Reduced Greenhouse Gas Emissions & Pollution: ECO friendly Solar Power Light Trailer System replaces JP-8 generator powered lights. No emissions or pollutants released into the environment. Reduction of Fossil Fuel Usage: Fuel cost for lighting eliminated for significant annual cost savings and reduces dependency on foreign procured oil. Lower Maintenance Cost: Eliminate engine/generator regular maintenance. Also allows automatic unattended operation. Silent / Stealth Operation: ECO Friendly Solar Power Panels replace noisy generator system. Improves on site communication capability and aids covert operations. 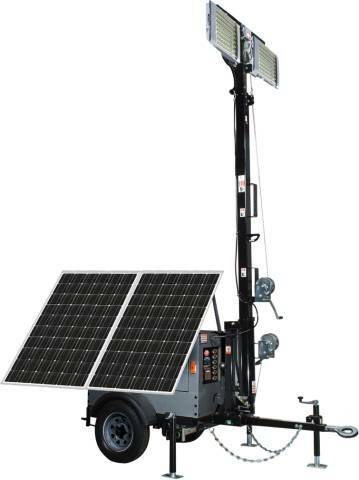 Moveable Trailers: ETI Solar Lighting Trailers are equipped with DOT standard towable trailers for quick setup, flexibility, and transportability. Compact design for rapid deployment and instant operation. Single person setup. Adjustable Illumination Heights: Adjustable 30 foot Mast allows light adjustment from 8 feet to 36 feet. 360-degree mast rotation and Pan/Tilt light fixture feature lets you put the light where it's needed. Modularly Expandable: Additional light and battery banks available for applications requiring more light or higher power requirements. Long Life LED Lights: LED lights offer longer operational lifetime than fluorescent lights. LED lights also operate in colder temperatures than fluorescent lights, down to –40°C. 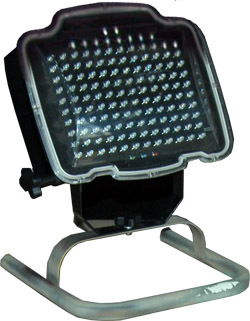 Optional Auxiliary Light:Additional lights can be added for specific applications or for mobile lighting applications. Optional Motion Sensor Activated Lights:Reduces energy usage and saves power for when light is truly needed. Eliminates “constant on” light situation. The Tactical Task Light (TTL) is a lighting fixture designed to properly illuminate the work surfaces of the Tactical Field Office. Using high-power LEDs with an output equivalent to a 100 watt bulb and 4-levels of dimming, the correct level of illumination is available for all tasks from reading, to typing, to close inspection of details. The TTL is energy efficient using less than 10 watts. 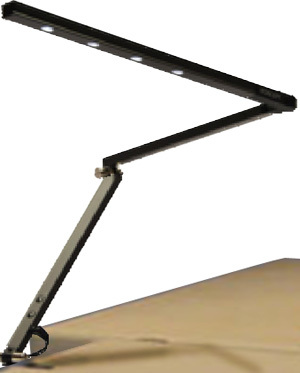 The rugged, jointed 3-stage arm allows positioning the fixture where you want it. With a lifespan of over 40,000 hours, spare bulbs will not be an issue in the field. Setup is quick; plugging into pivot-pin openings on the top-rear of ETI's Tactical Field Office NPS tray, or other work areas. When not in use, the TTL easily folds down tucking along the top-rear of the tray out of the way and secured by a Velcro strap. Adjustable Illumination Heights: Adjustable base allows light adjustment. 360-degree rotation and Pan/Tilt light fixture feature lets you put the light where it's needed. ETI's shelters are available equipped with several types of lighting for versatility in tactical situations.